Beowulf games with UCL Anglo-Saxon | D.A.R.E. A group of students of Anglo-Saxon have been developing videogames exploring Beowulf, led by Dr Vicky Symons and Professor Richard North. Here you can see four examples: a ‘manuscript game’ which explores the Beowulf manuscript’s context; a game level from Beowulf’s point of view; a game level from Grendel’s point of view; and a revenge game based on the Finnsburg episode in Beowulf. This project is part of the larger Playing Beowulf project, run in collaboration between the UCL Institute of Education, UCL English, the British Library and the University of Sydney, and funded by the Arts and Humanities Research Council’s Digital Transformations programme. The first is a video capture of a game by student Calum Cockburn, which serves as a prologue to two levels made by fellow students, in which the player can choose to play as Beowulf or as Grendel. The prologue explores the manuscript context of the Beowulf poem, transforming museum and library artefacts into a 3D playable environment, and leading up to the players’ two choices. The two choices both feature the ambiguous term ‘aglaeca’, used of Beowulf, Grendel and Grendel’s Mother in the poem, but differently translated in each case by successive translators. Here it suggests ‘heroic’ in the case of Beowulf, and ‘monstrous’ in the case of Grendel. 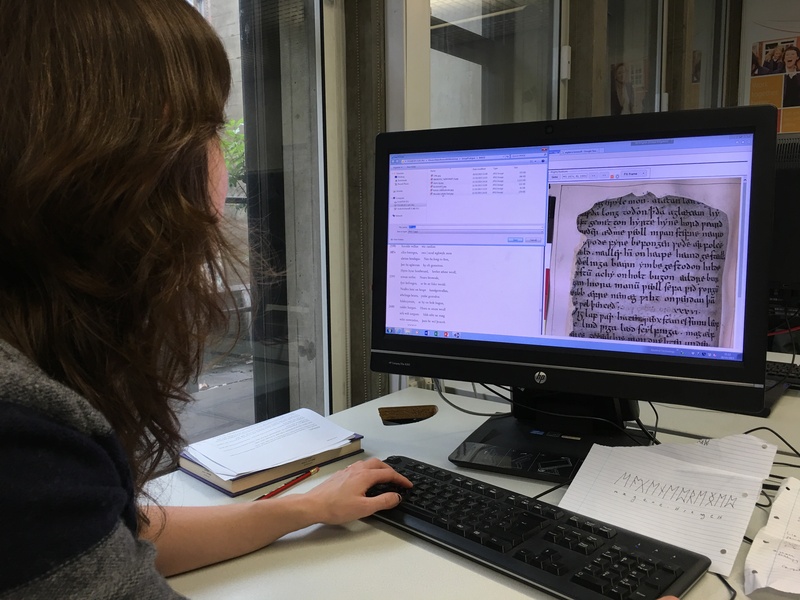 The picture below the video shows Vicky Symons searching the online Electronic Beowulf for instances of ‘aglaeca’ in the text. Calum explains his game design and its relation to the poem, the archive, and the other games made by his fellow students in the video below. His account, and his game, are good examples of the principle of co-curation envisaged by the wider project: a principle in which archival treasures such as the four codices Calum represents in his game are unlocked from their institutional context and made available for manipulation, inquiry and transformation: in this case both by Calum himself as a scholarly game-maker, and by the potential players he is aiming at. This game level, made by Emily Klimova and Will Ashford, shows one of the player options leading out of Calum’s game. The player is Beowulf, and has to follow manuscript leaves torn from the volume to find textual clues about Grendel’s approach. While focusing on these textual details, the game also uses music to signify themes and motifs from the poem. This game level, made by Rachel Burns and Sasha Burik, shows the other player option leading out of Calum’s game. Here the player is Grendel, and Rachel and Sasha have chosen to present him as ignorant of his identity, in order to build in clues from the poem which ‘explain’ his nature in biblical terms as a descendant of Cain. They then construct this cursed nature as the narrative motive for Grendel to take revenge on the race of men, prompted by his mother (spoiler alert!). The music, suggesting horror and combat, as well as recalling the midi composition of celebrated games such as Final Fantasy VII, is by Sasha’s brother. In the third example, Richard North has imagined how the obscure Finnsburgh episode in Beowulf, and its partner text, the Finnsburg fragment, might be transformed into a multi-level revenge game. This invokes on the one hand revenge motifs in contemporary videogame culture, such as games based on mafia-style feuds, and on the other hand the very similar codes and conventions of tribal feud running as undercurrents through Beowulf. Richard’s scenarios for this game, Avenge Hnaef, can be read in the document below. A 3D game version of the first level demonstrates how the game might look, represented here by a video capture of the play sequence.